Hall, Tracy Alan (2001). "Introduction: Phonological representations and phonetic implementation of distinctive features". In Hall, Tracy Alan. Distinctive Feature Theory. de Gruyter. pp. 1–40. Kingston, John (2007). "The Phonetics-Phonology Interface". In DeLacy, Paul. The Cambridge Handbook of Phonology. Cambridge University Press. ISBN 978-0-521-84879-4. Kiparsky, Paul (1993). "Pāṇinian linguistics". In Asher, R.E. Encyclopedia of Languages and Linguistics. Oxford: Pergamon. Maddieson, Ian (2013). 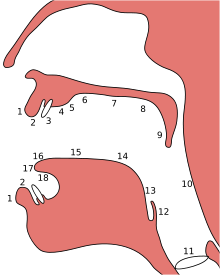 "Uvular Consonants". In Dryer, Matthew S.; Haspelmath, Martin. The World Atlas of Language Structures Online. Leipzig: Max Planck Institute for Evolutionary Anthropology.